Are you already looking forward to your next vacation in the sun? 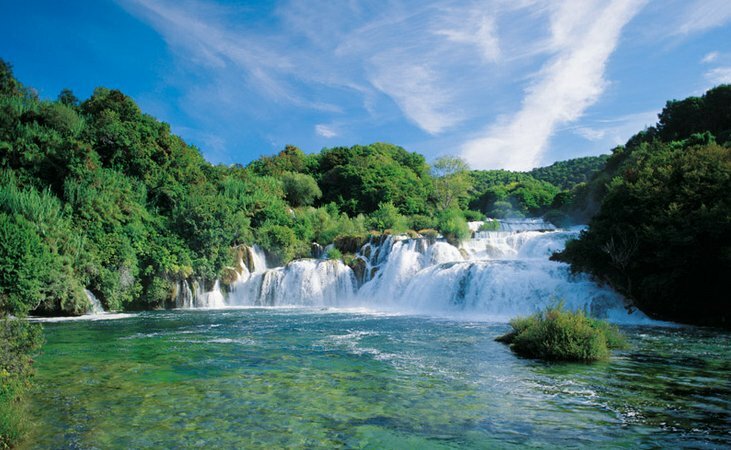 Have you discovered the beauty of Croatia yet? 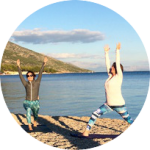 Join Jennifer Crisman to the beautiful Dalmatian region, near UNESCO cities of Split and Trogir for a week long yoga retreat to renew your mind, body and spirit. 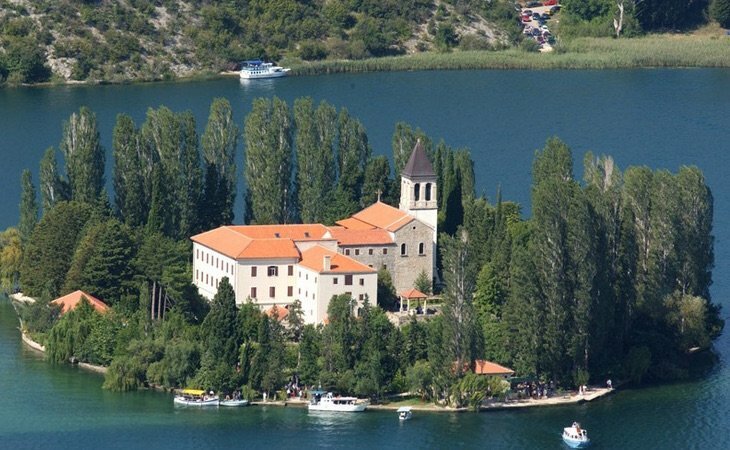 The retreat house sits up in the hills overlooking the Bay of Split with amazing views of the Adriatic sea dotted with islands and mountains. Only 10 mins drive to the nearest beach and centrally located to visit many UNESCO heritage sights within 20 mins. It is the perfect setting for practicing yoga, walks and meditation. 7 nights accommodation. 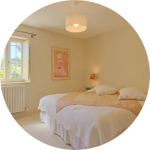 Choose a room with a double bed for one or two people or a room with two single beds. Nutritious meals served daily: healthy breakfast and dinner, with light lunch or snacks between when eating at the retreat house. Vegetarian and fish will be served. This retreat offers wine during the dinner service at no cost for those who wish. All other food & drinks outside of the house will be at your own expense. You are welcome to take a packed sandwich from the house for excursions. Outdoor swimming pool at your disposal to swim or relax poolside with your book. Free wifi. 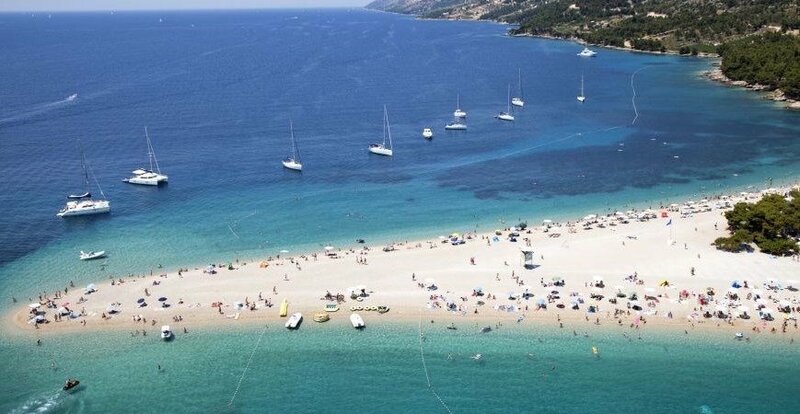 A visit to World Heritage UNESCO listed cities of Trogir and Split. 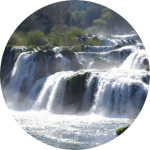 An excursion to the waterfalls of Krka National Park. Daily morning Vinyasa Flow practice and afternoon classes of restorative Yin and various workshop themes. Sunbathe on turquoise crystal clear local beaches within 10 mins drive. 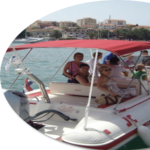 Full day motor boat excursion to beautiful islands for a fabulous day out in the sun, sea and beach. Towels, bed linen and cleaning of rooms (please bring your own beach towel for pool and beach). Massage, Reflexology, facial treatments available at local Croatian prices (additional cost). Students are responsible for their own flights but the rental cars are included in the price. It is recommended that we book the same flights but arriving at different times is not a problem since the house is located close to the airport. 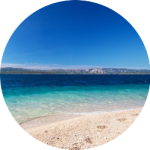 LuxAir now has a non-stop to Split (SPU) and they are currently 395€ roundtrip. Let’s book quickly to lock-in the price. I’m working with LuxAir to get a group rate that should be lower. Flight is additional. Car rental, all food in-house and boat trip included in the price. Extra food for excursions are at your own expense, as are massages. Check-in will be from Sunday 10h30 and check-out on Sunday by 8h30, based on flight times. To book your space, please email Jennifer at info@YogaBalance.lu and make a bank transfer for 400€ to ING LU08 0141 4597 4640 0000 to guarantee your space. Please pay the remainder in full by March 15th. Monthly payments are possible. Cancellation policy: A refund minus 100€ fee is only given when space can be filled. If desired, you can obtain Travel Insurance via your insurance agent. This retreat is open to all levels of practice. Yoga classes are offered daily but they are not mandatory. We will be going some sightseeing, beach days and a day on a boat. If you are looking to only chill out in one location & meditate then I suggest you wait for another retreat in the autumn. We will be exploring the surrounding areas since everything is very close by so short travel times. If you are a person that likes to go with the flow and stay flexible then this retreat is right for you. We want to keep a relaxed environment for all to enjoy their time away. So TREAT yourself or make this Christmas present a ‘no brainer’ easy for your significant other. You work hard all year long − give yourself a much deserved week to renew yourself with yoga, beach, sunshine, friends and delicious food that someone else cooks! Hope you will join me for this amazing week. The retreat has been amazing. Being in a gorgeous scenery, practicing yoga everyday, enjoying the free time in between the practices. It has been resourceful and unforgettable. I learned the benefits of practicing yoga everyday. And learned as well how to improve the postures without hurting myself. Thank you so much, Jen for making this adventure extraordinary by transmitting us your passion for yoga. A yoga retreat with Jennifer in a little corner of paradise may equal seven days of sheer bliss. One can only get fully immersed in this oasis of tranquility, and let their body and mind flow with the yoga beautifully taught by Jen. An amazing experience that I will gladly repeat in the future. Thank you Jennifer! I have been a regular at Jen’s classes since November 2013 when I first met her at a retreat. She has an incredibly warm and easy going nature that encourages everyone to do their best in the class. She is gentle but firm with newbies, always walking around and correcting postures and taking the time to ensure that no one is doing anything that could hurt them. With the more experienced students, she doesn’t accept half measures – pushing you to get to the next level every time. It’s not always comfortable but then, no one ever got anywhere by staying in their comfort zone did they? 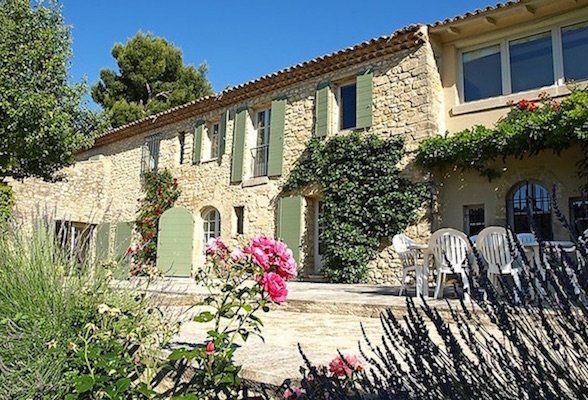 I’m very happy to offer you a yoga retreat at a private secluded estate located in Grambois in the heart of Provence, France. The 35 hectare property with forest, small lake, olive groves, lavender fields and swimming pool with beautiful views of the distant mountains, is the perfect setting for practicing yoga, walks, getting massages and meditation. During your free time explore the charming local villages. 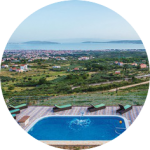 Enjoy yoga classes by the beautiful swimming pool with this amazing view of the hills and afterwards relax with a good book and soak up the sunshine! 7 nights twin bed in a shared spacious room with ensuite bathroom. Three different categories offered. Nutritious vegetarian food (fish served two nights). Healthy breakfast, light lunch and dinner served. 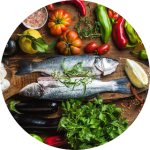 Special dietary needs can be accommodated. All other food & drinks outside of the house will be at your own expense, except dinner in Aix. You are welcome to take a packed sandwich from the house for excursions. Outdoor swimming pool set in beautiful gardens at your disposal to swim or relax poolside with your book. 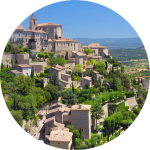 Visits to charming local villages in our area of the hilly Luberon region of Provence. 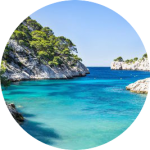 An excursion to the preserved mountainous coastal area of Parc National des Calanques. We will do a half day-hike to the beautiful beach Cove d’en Vau. Where we will swim in the turquoise waters of the Mediterranean sea and enjoy a picnic lunch. Possible half-day excursions to another beach with picnic, based on interest of participates. Daily morning Vinyasa Flow practice and afternoon classes of restorative Yin and various workshop themes. This schedule may vary depending on our excursions. Morning or afternoon walks/runs can be organized if desired. A half-day visit to Aix-en-Provence with dinner included in the price. No afternoon yoga that day. Access to the venue’s private lake, swimming pool, sun terrace and free wifi. Towels and bed linen included, please bring your own beach towels for pool and beach. Students are responsible for their own transportation to and from the retreat. We recommend and will help you arrange carpooling from Luxembourg so there will be no need for a taxi or car rental for the excursions. Gas and toll expenses will be shared by those in the car. It is also possible to travel by Train TGV or the nearest airport is Marseille. Check-in will be from Saturday 17hr and check-out on Saturday by 10hr. You can pay in full immediately (preferred) or make a deposit of 400€ to hold your space. Second installment of 400€ is due by June 10th and the remaining balance is due by July 10th. Also monthly payment arrangements are possible. A refund minus 100€ fee is only given when space can be filled. If desired, you can obtain Travel Insurance via your insurance agent. To book your space, please email Jennifer at info@YogaBalance.lu and make a bank transfer for the deposit of 400€ to LU08 0141 4597 4640 0000 to guarantee your space. This retreat is open to all levels of practice. Yoga classes are offered daily but they are not mandatory. If you would like to stay in bed until breakfast, do so. This is your time, spend it as you see fit! This retreat will be relaxed and not a rigid schedule. If you are a person that likes to go with the flow and stay flexible then this retreat is right for you. We want to keep a relaxed environment for all. So TREAT yourself or ask your significant other to contribute to what you really desire for your birthday this year. You work hard all year long − give yourself a much deserved week to renew yourself with yoga, beach, sunshine, friends and delicious food that someone else cooks! 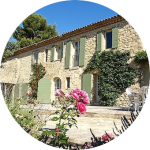 Check out more photos of my previous Provence retreats at the same estate www.yogabalance.lu/retreats. The smell, the colours, the food, the atmosphere and the quality of the very personal teachings, I will never forget it! Thank you! I loved the retreat! The location was tranquil and beautiful. 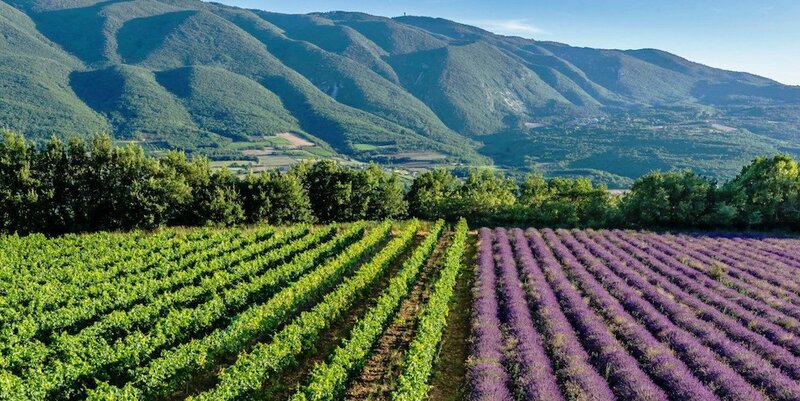 We could smell lavender from nearby fields during the daily al fresco yoga sessions. Jennifer teaches a right mix between feasible, challenging and fun yoga poses. Her passion for yoga and her energy are contagious and make every practice a treat. Afternoons were spend relaxing by the pool or exploring Provence. My batteries were completely recharged after one week.